Pest control concerns: Do pigeons cause asthma? When a pest is identified it is natural that the first concern is whether the animal concerned poses a risk to human health. Due to the nature of pest species many animals are a health concern owing to their capacity to spread germs and disease as a result of the areas they inhabit. But what about the animals themselves? Where pigeons are concerned there is certainly the possibility of there being a risk to health. Alarmingly pigeons can be the cause of breathing difficulties through people nearby inhaling dust from droppings. As well as being an unpleasant idea it is also an unpleasant experience for those who happen to be unfortunate enough to be affected. What is the link between pigeons and breathing difficulties? 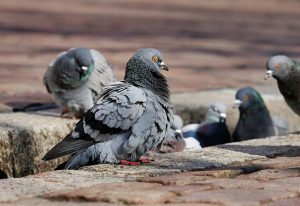 The main cause of breathing difficulties relating to pigeon droppings is a disease known as Bird Fancier’s Lung. It mainly affects people who have close contact with the birds either through their work or hobby. The disease is a form of hypersensitivity pneumonitis, which causes coughing, shortness of breath and sometimes a fever. The symptoms can appear to be very similar to asthma. Once found to be suffering from Bird Fancier’s Lung a person needs to avoid all exposure to pigeons and anything related that may trigger the condition. This should usually help the symptoms to go – along with steroid treatment. It can, however, become very serious if left to build up over a number of years and will scar the lungs causing fibrosis. While Bird Fancier’s Lung is the main respiratory concern connected to pigeons, birds are known to affect asthma. Like other animals that trigger allergic asthma, pigeons can do so through their feathers and dander. If the person affected by the allergic reaction suffers from asthma there is every chance that exposure to birds could affect it. While many people do choose to keep pigeons as a hobby many more people come into close quarters with pigeons as a result of a pest infestation. If pest pigeons have chosen to roost at your property or place of work them action is needed to make sure there is no risk to human health. For help controlling a pigeon pest problem get in touch with Total Bird Control.